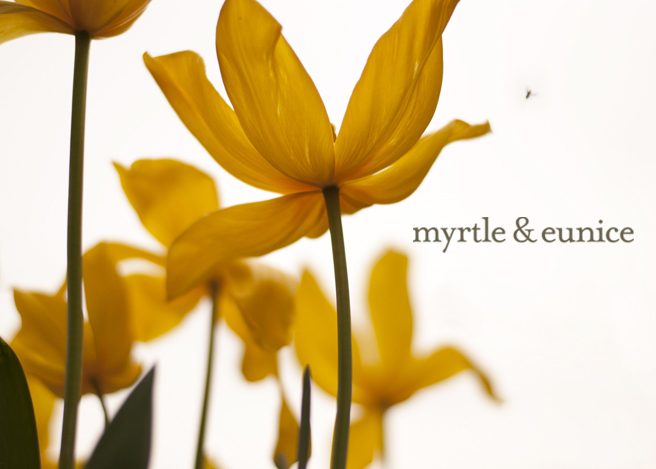 Myrtle & Eunice: Betcha Couldn’t Guess! Creative Spaces of the more, er, likely kind, right here. Hmmm....puzzling pots of....playdough?....plaster of Paris?....photo realism! Hmmm... are you breeding moss by chance? What will it be? Another egg? A chair? A magnolia tree? You are always up to mischief. I like it. It must be what keeps you so young. Have a wonderful mischievious week dear lady. I like the dino guess & reckon that's prolly it but I think it's also not out of the realm of possibility that your encouraging moss for the whole of your burb! Stinky starter culture for the whole street? mmmm, could it be a collection of "don't forget your hard hat" tree pom-poms (in an unusual squarish containerish shape)made out of plaster of paris ? Or is it lunch ? At first i thought it was plaster casts of something...like a dolls face but now i am thinking it is something you eat...like yoghurt. I wonder if you're planning an igloo of plaster of paris for tiny eskimos who dont like the cold all that much? I think it looks like you are making soap! base paint for clown faces? Enought to fill a mini? after much thought , i think you've gone into shampoo manufacturing. Hmm, it reminds me of the belly button moulds but I don't think so somehow... I agree with everybody else, something moldy or mouldy! Tell us soon, I'm intrigued. Just looks like those ice cream treats for doggies to me. Looks slightly browned in spots, like little meringues. Looking forward to finding out what it is! At first I thought you were making yoghurt-shaped soap, but that's not really mischievous, is it? I reckon you're making fake food, which you will dot around the neighbourhood to tempt and tease people. I would have to say mousse. But that's only because I always think about food... mmm... foood. It's probably a bicycle. Or a tree. I have no idea but I bet it's going to be ace. I'm thinking cosmetics/shampoo for your dog. Planning a long overdue night of romancing and dancing with your Mr, you sneakily replaced your children's lunch box yoghurt with your own concoction of herbally safe, but nonetheless effective, sleep inducing laced variety ... potent, with time delay built in, it is due to kick in tomorrow at 6.30pm ... at which point you placed sweetly slumbering smalls into bed, frock yourselves up, and then head out on aforementioned hot date, don't be late. You are one evil genius, Mrs ...shame on you? oh oh oh just stick a popsicke stick in them and into the freezer for a hot hot hot day!!! Unless it is the rich cream variety then quick! Make something with cream!!! DO NOT. I repeat DO NOT eat it straight. Wait for me! Ok, I give up, Ice cream, soap??? Hmmmm... first thought was you're making your own yoghurt, but maybe that's too obvious. I love Gemma's (Loz & Dinny's)idea, but my brain matter is rather fuzzy these days and lateral thinking just isn't on the agenda! False teeth for a rhino ? Are you casting some sort of mini-sculptures or setting them into some sort of jelly stuff? Now... I know you have work to do.... but have you cleaned the bathroom with a toothbrush and arranged the contents of the pantry in alphabetical order yet....? I never see you coming - you are just too creative. So my guess would be bound to be wrong. and boring. There are 5 pots.... there are 5 of you.... nope not helping. plaster of paris is probably involved but how - not a scooby. no i know.. tiny animal tracks are drying underneath , imprints. nah, going back to the deoderent..
you've installed a fingerprint lock system on the front door and this is you making 'spare keys'. I think it's being over analysed. What really happened was someone whipped off all the tops to the yoghurt? You have a rampant yeast infection? very intriging photo1 made me click! What? 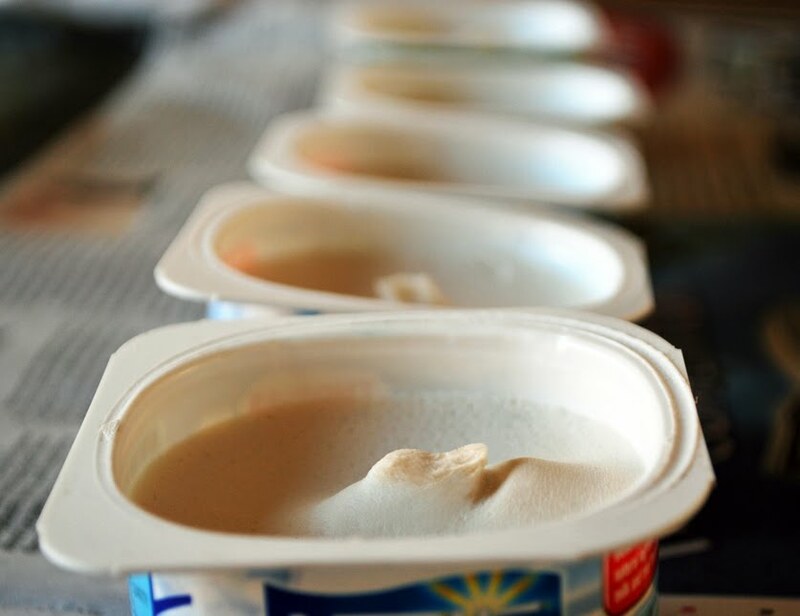 yoghurt pots with goop in!? I am braindead... all I see is yoghurt, maybe kids yoghurt... Petit Miam? I hope it is something unexpected that no one guessed. air drying clay in yoghurt pots... that's my guess! Is it a homemade body butter of some sort? or layered frozen pudding cups? are you knitting with yoghurt? Are you planning to string these around a tree and leave them to go mouldy in a kind of funky fairy lights-with-mould? Are you making more moss? Or perhaps sculpting a statue that you can knit a cardi for? they are plaster cubes and you're going to crochet little jackets for them to look like Rubix cubes! Organic Anti-Ageing eye cream as a gift for the mumma dinosaur and her friends who laid those eggs. Mini building blocks for an obstacle course for your pet insects? You're probably going to crochet a cover for each of them too, aren't you. Ooh! Is it a new stork's bottom?!?!?!? I don't know what it is and I'm not even going to try and guess but please tell us soon because I CAN'T HANDLE THE SUSPENSE! I'm absolutely useless when it comes to surprises and horror films and guessing competitions, the expectation and anticipation kills me. Maybe there are seeds hiding in the whitish stuff, maybe strings poking from the bottom of the tubs. Could be linked with next craftbombing operation. Possible bird snack tree bauble bombing. You captured a bog baby and are performing secret cloning experiments (to make them stronger, faster but tastier?). It looks like creamed honey? or homemade deodorant? Reading the guesses in the comments alone has made my night :-) I look forward to the Big Reveal. reading the answers after knowing what it is is hilarious! you are wickedly funny Mrs T!